A Cozy Little Scarf For Anyone! I knitted this neck scarf out of my imagination and didn’t have any written pattern. I wrote the pattern after I finished the piece. I call this mini scarf “crossing leaves” because it has 2 leaves crossing over each other at the front. The leaves are knitted in garter stitch and the body of the scarf (neck warmer or neck cozy) is knitted in stockinette stitch. The pattern looks pretty long because I wrote it in a very detail description. It’s easy enough for beginners, I think. You can adjust the length to fit your need. I knitted this neck warmer for my five years-old daughter, that’s why it looks a little tight on my neck in the picture shown below. This pattern is available in PDF format. Click Here to download. or chunky yarn of your choice. Row 1: K into front and back of a stitch, I will refer to this as "M1" or "Make 1". Row 3 and other alternate row: Knit. Row 16 to 17: Knit. Row 19 and other alternative rows: Knit. Row 25 (ribbing): *K1, p1; repeat from* to the end. Row 26: *P1, k1; repeat from * to the end. Repeat row 25 and 26 two more times. Make 1 to all of the stitches. You will have a total of 14 stitches. *K1, k2tog, repeat from * to the end. You now have 14 stitches. Row 1: *P1, k1; repeat from * to the end. Row 2: *K1, p1; repeat from * to the end. Repeat these two rows one more time. Then do row 1, one more time. Row 1: *K1, p1; repeat from * to the end. Row 2: *P1, k1; repeat from * to the end. Repeat these 2 rows two more times. Next row (joining ribbing pieces together to form a ring): Knit the first stitches and the following stitches on the needle and the holder together. (If this is too confusing for you, you can try this method: Slip the first stitch off the left needle, knit the first stitches from the stitch holder and slip the slip stitch over the stitch just knitted) Now you should have 7 sts on the needle. K 1 row. Do the second leave as follow. Row 1: M1, k to last stitches, M1. Repeat row 1 and 2 until there are 15 stitches all together. K 2 rows. Continue decreasing as the above 2 rows until there are 3 sts left. Next row: Slip 1, k2tog, pass over. K 1. Cut off yarn leaving 6 inches tail. Weave all the loose ends of the yarn at the back of work and block the piece if preferred. 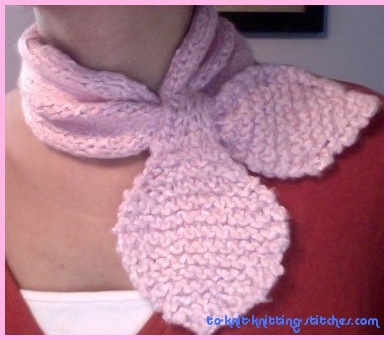 You now have completed a “Crossing Leaves Neck Warmer or A Mini Neck Cozy”, Congratulation! Now it’s time to Share Your Photo Here. 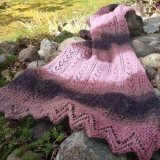 Click Here to download this pattern in PDF.